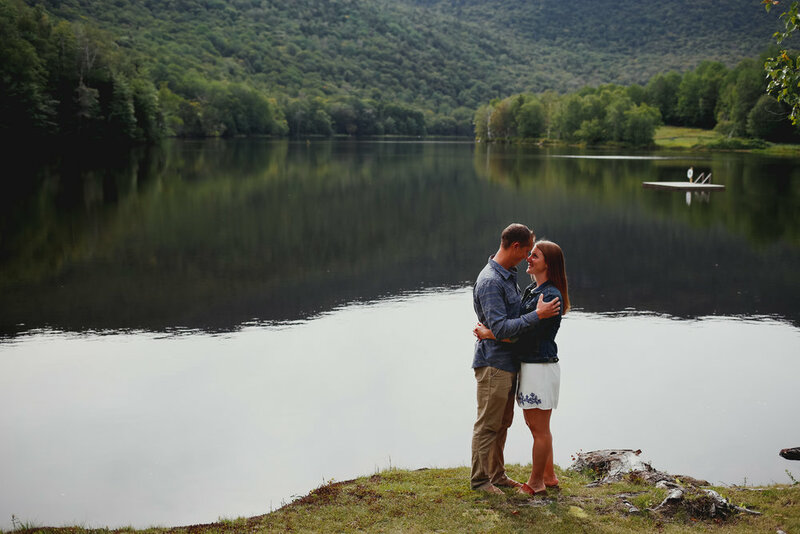 I had never even heard of the Lake Mansfield Trout Club until Meg mentioned she’d love to spend time there for her engagement session, and boy, I’m glad we did. I’ve seldom seen such a beautiful place in Vermont, and Vermont is pretty gorgeous on the whole. Meg’s grandparents are members at the club, and she convinced her whole family to come up for the weekend during the session so she and Nick could hang out with everyone before and afterwards. I loved exploring around this historic property, especially in the boathouse, where Meg and Nick found a locker with their future family name, Bouchard! It was also a treat to get to meet most of Meg’s family and get excited about the September 2019 wedding, where we will reunite for more celebrating. Joanna and Toben reached out a few months ago to see if we could all meet up and collaborate on a mini session so they could get a sense of what working with us was like before their wedding next month. Because they're an adventurous couple (they both quit their jobs and spent four months in New Zealand, Australia, and Hawaii last year!) and let us choose the location, we picked a favorite spot of ours, the Path of Life Sculpture garden in Windsor, Vermont. We talked about their wedding and their recent life changes (they just moved to the Upper Valley, which we're pretty excited about) over beers, then walked over to the sculpture garden, where we navigated the giant hedge maze and ran up and down hills in the fields surrounding the nature-inspired sculptures. We can't wait for the live music and handmade truffles at their wedding in Brandon in just a few weeks!